Acquired by the Ducks on Thursday, Evgeny Artyukhin totaled six goals and 16 points in 73 games with Tampa Bay in 2008-09. The Ducks announced on Thursday that they have acquired right wing Evgeny Artyukhin from Tampa Bay in exchange for left wing Drew Miller and a third-round selection in the 2010 NHL Entry Draft. Artyukhin, 26 (4/4/83), appeared in his second NHL season with the Tampa Bay Lightning in 2008-09, scoring 6-10=16 points with a +1 rating and 151 PIM in 73 games. Artyukhin set career highs in goals, appearances and PIM while leading the team in hits (249) and PIM. The 6-4, 254-pound winger also averaged 10:40 time on ice (TOI) per game and 14.8 shifts per game. Originally selected by Tampa Bay in the third round (94th overall) of the 2001 NHL Entry Draft, Artyukhin has played two seasons with the Lightning (2005-06 and 2008-09). In 145 career NHL games, Artyukhin has collected 10-23=33 points with 241 PIM. He made his Stanley Cup Playoffs debut with Tampa Bay in 2006, earning 1-0=1 point in five games during the Eastern Conference Quarterfinals vs. Ottawa. He has also appeared in 102 career American Hockey League (AHL) contests with Hershey (2003-04) and Springfield (2004-06), scoring 14-23=37 points with 257 PIM. A native of Moscow, Russia, Artyukhin has played five seasons in the Russian leagues since debuting with Podolsk of Russia-2 in 1999-00. In January 2003, he helped Team Russia capture gold at the 2003 World Junior Championships in Halifax and Sydney, Nova Scotia, recording 1-0=1 point and 10 PIM in six games. Miller, 25 (2/17/84), appeared in 27 games with Anaheim last season, scoring 4-6=10 points with 27 PIM. He played in all 13 Stanley Cup Playoff games with the Ducks, earning 2-1=3 points with two PIM. Originally selected by Anaheim in the sixth round (186th overall) of the 2003 NHL Entry Draft, Miller has collected 6-9=15 points with 23 PIM in 53 career NHL games. He won his first Stanley Cup championship with the Ducks in 2007. We’ve traded our third round pick this year and Drew Miller to Tampa Bay for Evgeny Artyukhin, a big winger. The purpose of the deal is we had changed our team a little bit. We had gotten a bit more skill and moved a few things around. In doing so, we lost a little bit of our size, sandpaper or grit. We have been trying to find a way to patch that for a little while. We had talked to Tampa just before the trade deadline about this gentleman and it didn’t quite work out. Again at the draft, Brian Lawton and I had a few discussions about that right on the draft floor, the second day of the draft. We said ‘Let’s talk later in the summer’. We decided now was the time to make it happen. I thank Drew Miller for his efforts and his time. He had a good run here with us. He was up and down a fair amount. He was a little bit like Bobby Ryan. He was a guy that moved down and it was a bit unfair to Drew. He handled it well and he played well for us. He was part of our run last year. The year we won the Cup he was up the whole time. Obviously, they wanted him in this deal. That is what happens. You have to give a little bit to get when you think you need as part of your puzzle. 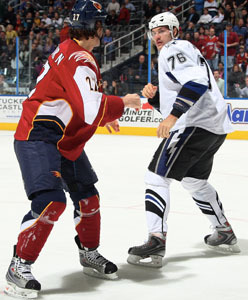 Artyukhin has no problem dropping the gloves, having led the Lightning with 151 PIM last season. But Ducks Ducks GM Bob Murray said "The guy has some skill too. He's more than just a big man out there." I have no idea. I’ve said this many times before, Randy is the coach of the hockey team. We put the players there. Randy decides on who plays with whom and how they are going to play. Obviously, he and I talk about a lot of things. But that would be presumptuous to even think what he’s going to do. We’ll see what all shakes out. We’ll see what happens. This guy has skill too. He’s a big man, but he has some talent too. Don’t forget Rick Paterson worked for Tampa Bay, my right-hand guy when it comes to the hockey part. He worked for Tampa Bay for a number of years. He’s a guy we’ve identified for awhile here. He’s more than just a big man out there. The one thing that happens with our hockey team, which I like and Randy does very well, is he gives responsibilities and roles. He holds people accountable to that. I’m not saying other teams don’t. I just know what our coach does. We’ll see what Artie, I guess they call him Artie, we’ll see what he can adapt to with Randy. If you recall Travis Moen, when we got him he didn’t play very much that first year. It took Travis a little while to figure out exactly what Randy wanted. When Travis did figure out what Randy wanted, the rest is history. Who knows? This is somewhat a similar situation. I know I like the raw assets of this guy. We’ll see what develops from those assets. Yes. This is something I wanted to get done before. We got Pogge the other day. The last few years we’ve always been traded for No. 3 goalies at the end of the year. I didn’t want to do that anymore. We decided that we had a chance to get a young man in Pogge, who was not only a third goaltender, but he was still a prospect because he is so young. Some size on the wing was definitely something. We said, ‘If we can get it done before the start of training camp, let’s get it done’. Now, I think we’re in a position where we go to camp. I think we’ve created an atmosphere where there is going to be competitions for jobs, competitions for ice time and in different roles. I think that is healthy. I always think competition from within is good. I think you’re going to see there is going to be a lot of spots out there where there is going to be competition for ice time. As a player, that is what you want. You want ice time. You want to play. I think we’ve created a good competition here at the moment. He’s got one year left. One year and then he’s unrestricted at the end of the year.